Description: Fisher-Price had produced alot of popular Circus sets over the years, dating back to their first year in business, 1931's #201 Woodsy-Wee Circus. 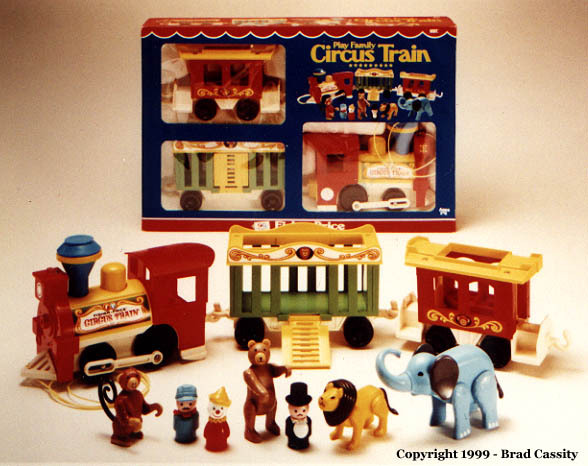 So it seemed inevitable there'd be a Little People circus set sooner or later, which finally came along in 1973. The well-crafted, attractive animals (decendants of their #915 Farm cousins) helped make #991 a smashing success with kids, leading to a long run as well as a few spin-offs in the #135 Animal Circus and the #2581 Express Train. In 1979, for no apparent reason except to save money, #991 was redesigned and downsized for the remaining seven years of it's run. 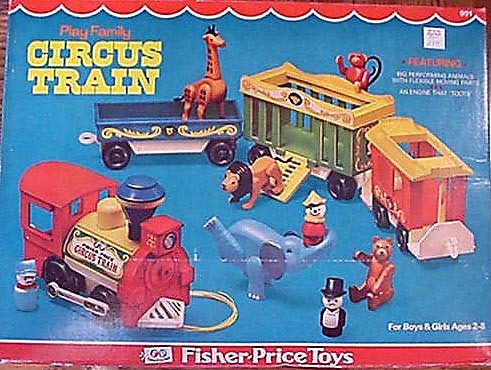 The flatcar and the giraffe-who would later show up in the Animal Pals series--were omitted, and minor changes were instituted on two of the remaining cars and three of the remaining animals for a less appealing package. FPT280 - 2-Seat train engine with a YELLOW "push-button" on top that makes a "toot-toot" sound. Rolls on 4 black wheels with piston-rod action. Has a hook on back to attach other train cars. The train can be pulled by a plastic plastic pull string. The pull-string attaches to a hole in the front "cow catcher". Train's headlight is a 3-side PAPER LITHO (covers front and both sides). FPT707 - Green cage car with a yellow top, a yellow fold-down door on the side, a lion litho on the sides, and no clown litho on the ends. FPT705 - Blue flatcar with a lion head litho on the sides. FPT708 - Red caboose with a yellow top, white ends with stairs, yellow opening doors on each end, and a monkey litho on the sides. XC - Giraffe with black horns and orangish brown spots on neck and legs. XS - Lion with a black mane and tail. XA - Blue elephant with dark grey ears and a long curled trunk that is designed to hold a Little Person. XY - Brownish-orange monkey with a long curly black tail. WB - Orangish-brown bear with a tan tummy and snout. JHWP - Short light blue train engineer with a moustache, light blue "Puffy-style" engineer's cap, and an orange non-triangular scarf. OWP - Short black body ringmaster with a thin moustache, a black top hat, and a white bib collar. DUWP - Red circus clown with a yellow pointed hat and a yellow ruffled collar. FPT706 - Blue cage car with a yellow top, a yellow fold-down door on the side, a giraffe litho on the sides, and a clown litho on the ends. FPT704 - Green flatcar with a lion litho on the sides. 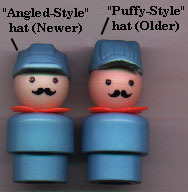 JHWP or JHPP - Short light blue train engineer with a moustache, light blue "Puffy-style" engineer's cap, and an orange non-triangular scarf. OWP or OPP - Short black body ringmaster with a thin moustache, a black top hat, and a white bib collar. DUWP or DUPP - Red circus clown with a yellow pointed hat and a yellow ruffled collar. FPT292 - Green cage car with a yellow top, a yellow fold-down door on the side, a giraffe litho on the sides, and a clown litho on the ends. JHPP - Short light blue train engineer with a moustache, light blue "Puffy-style" engineer's cap, and an orange non-triangular scarf. OPP - Short black body ringmaster with a thin moustache, a black top hat, and a white bib collar. DUPP - Red circus clown with a yellow pointed hat and a yellow ruffled collar. FPT4540 - 2-Seat train engine with a YELLOW "push-button" on top that makes a "toot-toot" sound. Rolls on 4 black wheels with piston-rod action. Has a hook on back to attach other train cars. The train can be pulled by a plastic plastic pull string. The pull-string attaches to a hole in the front "cow catcher". Train's headlight is a SILVER heat-stamp (circle within a circle). WA - Grayish-brown bear with a tan tummy and snout.Grayish-brown bear with a tan snout and tummy. VPP - Short light blue train engineer with a moustache, light blue "Angled-style" engineer's cap, and a non-triangular orange scarf. 1973-1978 Version - FPT280 - 2-Seat train engine with a YELLOW "push-button" on top that makes a "toot-toot" sound. Rolls on 4 black wheels with piston-rod action. Has a hook on back to attach other train cars. The train can be pulled by a plastic plastic pull string. The pull-string attaches to a hole in the front "cow catcher". Train's headlight is a 3-side PAPER LITHO (covers front and both sides). 1979-1986 Version - FPT4540 - 2-Seat train engine with a YELLOW "push-button" on top that makes a "toot-toot" sound. Rolls on 4 black wheels with piston-rod action. Has a hook on back to attach other train cars. The train can be pulled by a plastic plastic pull string. The pull-string attaches to a hole in the front "cow catcher". Train's headlight is a SILVER heat-stamp (circle within a circle). 1979-1986 Version - FPT280 - 2-Seat train engine with a RED "push-button" on top that makes a "toot-toot" sound. Rolls on 4 black wheels with piston-rod action. Has a hook on back to attach other train cars. The train can be pulled by a plastic plastic pull string. The pull-string attaches to a hole in the front "cow catcher". Train's headlight is a SILVER heat-stamp (circle within a circle). WPP - 1981 catalogue shows a tall light blue engineer. FP991BOX1973 (Box ONLY) - 4-train-car version sold in a 34-1/4" long, 3-1/2" wide, 6" high box. FP991SET1973 - Complete set (4-train-car version) in original box. FP991SET1979 - Complete set (3-train-car version) in original box. 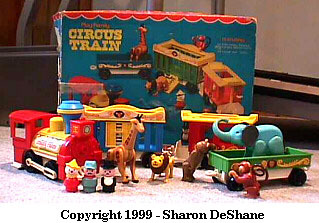 The train engine, flat car, and caboose were modified for 1987-1990's #2581 Little People Express Train. Also see the #135 Animal Circus.